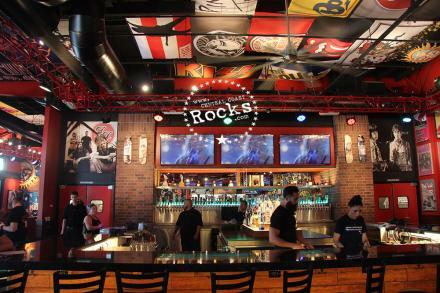 Rock & Brews Downey is located at the popular Stonewood shopping center and is the brand’s ninth location in California. 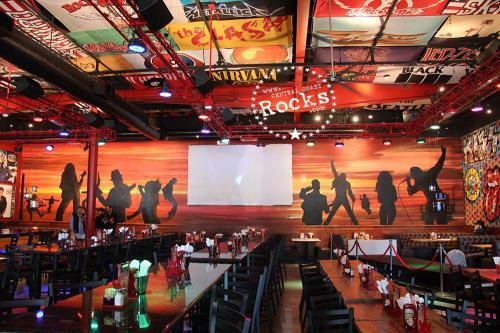 As the largest location in Los Angeles County to date, the 8,400-square foot, rock-inspired restaurant, features a private dining area that can seat up to 100 guests and serves as the perfect setting for all types of events. 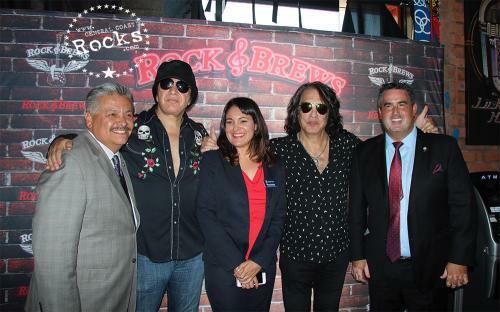 Gene Simmons and Paul Stanley rock legends and co-founders of Rock & Brews restaurants, attended grand opening activities for the new location in Downey on Tuesday, August 29, 2017. 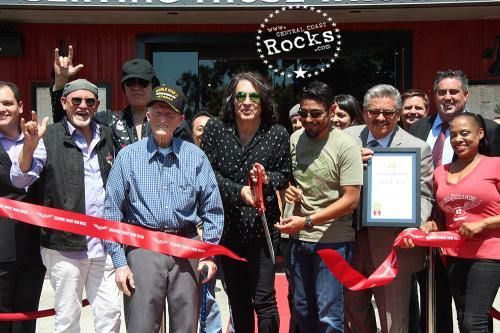 Celebration activities included a ribbon cutting and private luncheon at 1 p.m. hosted by the rock icons for more than 100 veterans and active military, as well as an evening event from 6 p.m. to 9 p.m. that included a sampling of Rock & Brew’s quality American Comfort food. Guests have access to a full-service bar that showcases a selection of more than 100 craft and international beers. With abundant seating, families are welcome to enjoy the custom play structure for kids, large scale Jenga, and board games available on the dog-friendly covered patio. 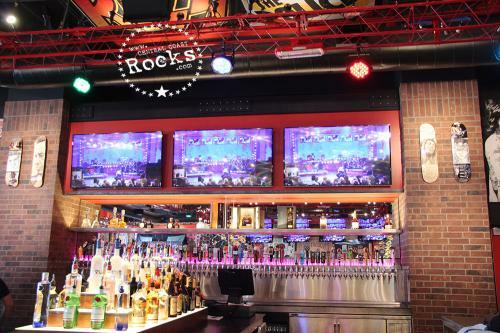 With numerous flat screen televisions displaying concert-style rock videos and sporting events, Rock & Brews Downey is the perfect spot to gather with friends and family to pay tribute to rock legends, good food and the best brews! Monster Godzilla Burgers. Gluten Free Beers, as many as fifty to a hundred Craft Beers. There’s so much great food. 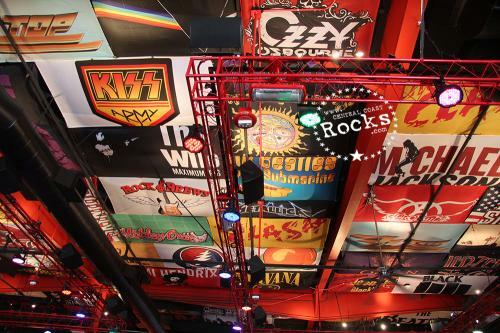 As much fun as you can have with your pants on.” KISS & Rock & Brews co - founder Gene Simmons told us before the day’s festivities began when asked about his favorite menu items. “We are very excited to be a part of the beautiful city of Downey and look forward to contributing to the flourishing community with our unique dining and entertainment experience,” said Stanley and Simmons in a joint statement. 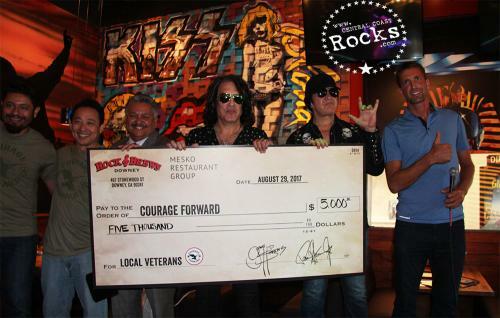 “We also look forward to honoring the veterans and active military who dedicate their lives for our country.” “I think just the fact that the Military doesn’t get the attention, respect or care that they deserve is staggering.” Stanley added when asked about KISS’s history of helping our nations Veterans. 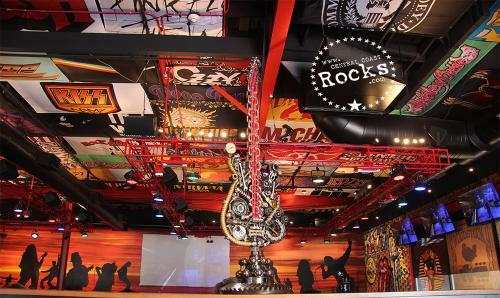 Rock & Brews is a one-of-a-kind, rock-inspired restaurant and entertainment concept designed to engage people of all ages with quality comfort food and local favorites, a broad selection of craft and international beers, and an energized environment that is reminiscent of being at a family-friendly music event. A revolutionary new concept, where at-promise youth unite with Veterans to find purpose together; forming unique tribes in which courage forward becomes a way of life. Our Veterans and at-promise youth strive to become bigger than themselves through inspiring, teaching and learning. Across America, one-third of all our youth have no positive role model; so many missing fathers, broken families, or families just struggling to make ends meet. On top, these same youth then face new heights as they attempt to transcend from middle school to high school and wrestle with more pressure around “who am I?” and/or about “being a man” – yet having no idea what that means. These youth are sadly lost. We believe these lost youth fall into twoyouth groups: Just Lost or In Crisis At-promise youth will be matched with a primary vet within a team, but will have the family support of the whole group. Connecting with communities around work, fun, and giving back; being of service and building a stronger community. Central Coast Rocks: Thank You for your continued support of our Veterans, most notably the Wounded Warrior Project. 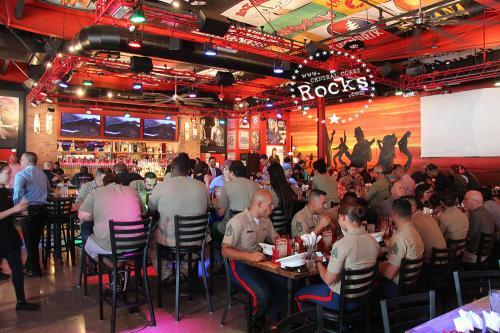 As with each Rock & Brews opening, Veterans & First Responders are first through the door. Was there a certain Event or Personality that inspired you to support our troops and veterans? Gene Simmons: My Mother is my biggest inspiration, in life and work and everything else. But from her perspective she was fourteen when she was in a Nazi concentration camp and our whole family was wiped out, my Mother survived. And if it wasn’t for the Americans coming there, they did a good thing. They took out the bad guys and opened the gates. I was born a few years after that and slowly through the eyes of my Mother I learned that even though I was born in the Promised Land Israel, that the only real Promised Land is America. Nowhere else can first generations, legal immigrants come here and access all the power, all the potential that native born Americans have for hundreds and hundreds of years. So if your family has been here for generations and I’m a first generation legal immigrant I go right to the head of the line with you. I have the same opportunities. That is more than I ever expected, I would understand if America said look you just came here, go to the back of the line, that’s fair. 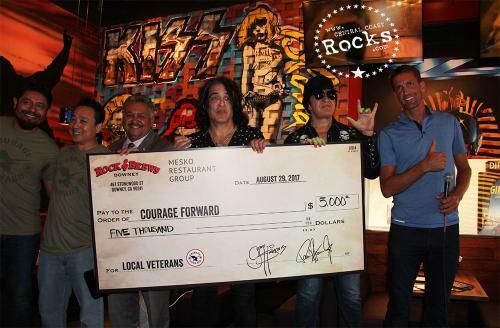 Paul Stanley: I think just the fact that the Military doesn’t get the attention, respect or care that they deserve is staggering. My Mom fled Berlin before World War Two and then fled Amsterdam and what’s proven time and time again, who saves the world? The Troops, our American Troops save the world time and time again. It’s staggering that the Military are people who are Volunteeers. Volunteering to go into harm’s way to protect the Country they love and come back and aren’t….forget about rewarded, they aren’t given what they need. It’s a sin, it really is, so if the Government can’t do it then we have to do it ourselves because they did it for us. So for us to open our doors first in a ceremony for our Troops is really a small way that we can spotlight their plight. We’re talking about proud men and women, and we’re not only talking about them but how their service impacts their families, their children. So it’s important for somebody to stand up and speak out, it’s important for somebody to do something in addition, and that’s to write a check. We can all do that, I always tell people you don’t give until it hurts, you give until it feels good. You should know what you’re capable of giving and give it. People have given, given everything and they’ve come back, some of them broken. 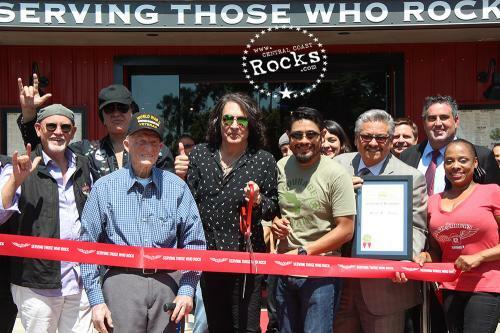 Rock & Brews is terrific because it’s a way for us to enjoy our lives, for everyone to enjoy what this Country is and at the same time make sure that we’re giving back and paying tribute. We’ve done that with the band, there’s times we’ve given a dollar from every ticket to Wounded Warrior Care Project or other organizations. It’s easy to talk it, but you gotta walk it, and we try to do both. 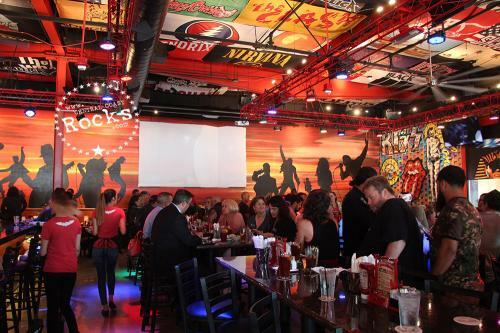 Central Coast Rocks: Rock & Brews opened its first location ( El Segundo ) Five years ago in 2012, what are some things you Rockers have learned being in the Restaurant Business and what are the Restaurant’s goals in the coming years ? 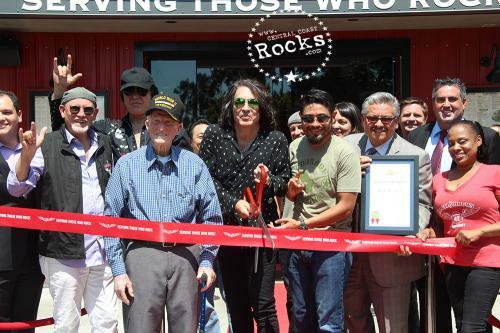 Gene Simmons: The more you get involved with Rock & Brews the more you realize this is a privilege, that it’s not a necessity, and that people don’t have to leave their homes to get a bite to eat. Think about it, it’s so much easier to stay at home and order, the food comes there and the food’s good, not a problem. I’m not saying there’s anything substandard about that. So you stay at home, you watch T.V., you don’t have to fight traffic, deal with baby sitters. 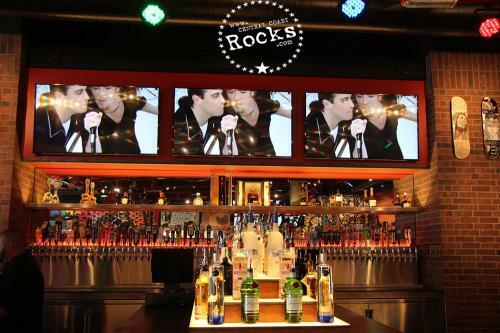 You’re going to do us the honor of coming out to a Rock & Brews? You’re going to fight traffic, you’re going to do all that stuff. 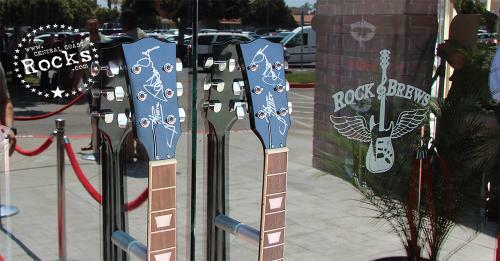 The least we can do, if you aren’t a Rock Star is make you feel like one from the time you walk in through that door. That’s why people love it, we are always full. Gene Simmons: No, and if you do you pinpoint it by what went wrong because you want to fix it. One little hole in a big ship can sink the whole ship. 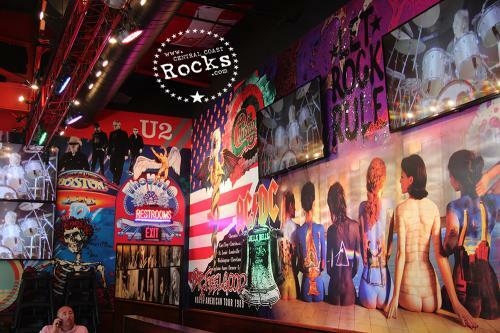 Paul Stanley: It’s really true, it’s a place that once you go to, you go back to, for all reasons. The ambiance, the food, the comradery. It’s the restaurant, again, I want to go to. 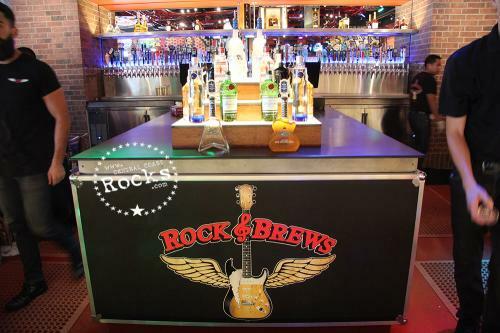 Central Coast Rocks: Rock & Brews Menu offers a creative spin on fresh, quality American comfort food, what are some of your personal favorite dishes? Gene Simmons: Well I just went on a diet so that means salads and protein. But a short time ago bearnaise on the Desserts, there’s also Bread Pudding. As much fun as you can have with your pants on, see what I did there? Monster Godzilla Burgers. Gluten Free Beers, as many as fifty to a hundred Craft Beers. There’s so much great food. 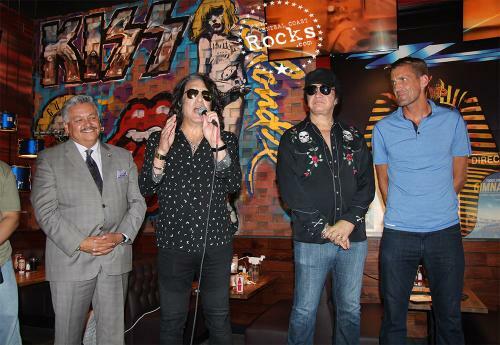 Paul Stanley: We have a burger called the Gastropub with a fried egg and bacon, cheese. You can eat that on the way to the gym. We have great pretzels, huge dough pretzels where we bring the dough in from Germany. Great Fish Tacos, great Pulled Pork. Terrific Pizza, Gluten Free Pizza, we have great Salads. I cant pick just one, because all the food is great, it’s just a matter of what you’re in the mood for. 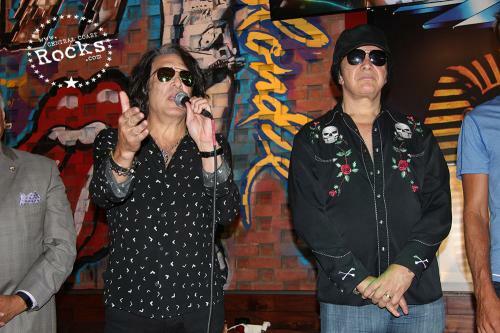 Gene Simmons: Well, KISS continues, we’re very lucky. We’re touring all the time in some place in the world and you can find out. But my suggestion to anyone who wants to check it out, (Rock & Brews) don’t call ahead and tell people you’re coming. 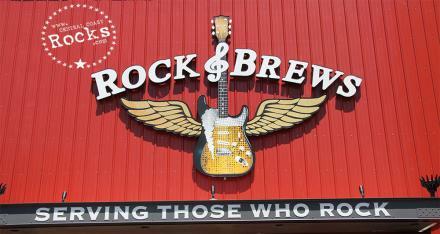 Just come to any Rock & Brews unannounced and you’ll be blown away. 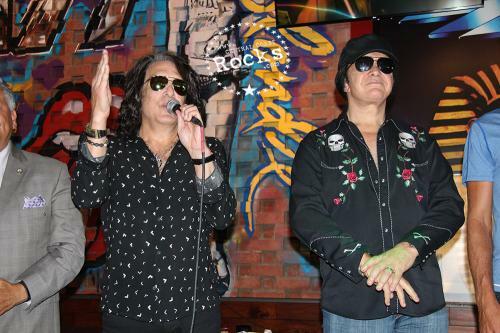 Paul Stanley: We’re here this long because we’re doing something right and we’re going to continue doing it.